Sorry, but it was brought to my attention that the video I referred to in the newsletter yesterday, was actually not there. I didn't want you to miss this, so here it is. This amazing video by brain scientist Jill Bolte Taylor is something I think everyone should see -- her personal "enlightenment" story of her own experience having a stroke and losing normal intellectual functioning. She had what yogi's would call a cosmic or non-dual experience of the interconnection of all things, and this experience profoundly changed her life and her understanding of reality. Enjoy! Going Blank: When your brain seems to betray you. Inner Vision: Clearing the Way to Finding your Life Purpose. Meditation: The HamSa technique (the origin of Mindfulness Meditation). Ask-the-Therapist Forum. Ask me any question and see it posted on the website with my answer (you don't have to give your real name).Ask away! (I'll do my best to give you a helpful and honest answer). Official Release of the NEW eBook! Tapping Into Joy: Meridian Tapping and Mindfulness for Depression. 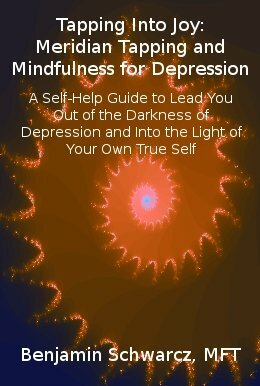 This 96-Page eBook covers a wide range of issues and root causes of depression and shows you how to awaken to your natural state of peace and happiness. Tapping Into Joy: Meridian Tapping and Mindfulness for Depression - Available Now. Going Blank: What does it mean when your mind goes blank, fuzzes out and seems unable to function? This is a question that many people have when depressed. What I've found in my work with clients is that a high percentage of those with these symptoms are normally heavy “thinkers.” Rather than focusing on emotions or intuition or body sensations, they are more likely to look to their intellect to make sense of their reality and to feel a sense of purpose or self-understanding. When I ask, “what are your feeling?” they might respond with “I'm wondering how long I'm going to have this depression and trying to figure out why I've gotten myself into this mess...” (wondering, and trying to figure out, is about thinking, not feeling). Feelings are much more simple and direct than thoughts, but for those that rely heavily on their thought process, emotions often seem vague, irrational and out of reach. It is a common symptom of depression to have poor concentration, poor memory and other thinking difficulties. The medical approach is quick to dismiss these as typical symptoms of a “disorder” that is based on chemical imbalances. I believe a more useful perspective is to see the body and mind as one unit (so I'll call it the body-mind). 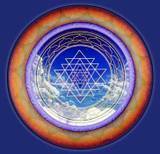 The body-mind is an intelligent, ever changing, ever-growing energetic consciousness. Much more than just your brain or the body. We actually have many "bodies" or layers within us (the ego, the physical body, the mental and emotional body, the energy body, and so on. At the deepest core of our Being is the pure essential Self -- pure conscious, thoughtless awareness. The source of all wisdom. We can call this the Self (with a capital 'S'). The Self is aware and yet seperate from thoughts and feelings. Even when you seem to be completely overwhelmed with your thoughts or emotions, the Self is silently watching the whole show, without interfering in it. Since we tend to incorrectly identify our thoughts as the real Self, we may feel very frightened when our thinking betrays us - when we seem to no longer be able to function - it may feel like we're going to go crazy or even dying. The mind goes blank and you don't know what to say; or you can't remember what you were supposed to be doing. We may get angry with ourselves and believe we're really messed up. We may feel very embarrassed and ashamed of this, and try to cover it up and pretend to function as we used to, all the while feeling panic inside. But the fact is, very often these symptoms are potentially a good thing if we can look at them another way. We were not made to operate like machines. We didn't evolve inside a cubicle under florescent lighting, with a phone growing out of our ear. We didn't start out in life with a full schedule and no time to play and have fun. We were made to daydream, and to be spontaneous, to have original ideas, to explore the unknown, to express feelings impulsively and to enjoy our own body sensations. If you can trust that there is a deeper healing force within you that is guiding you towards wholeness, then you're already half-way there; but if you react to this shutting down of the intellectual mind as a problem to be fixed, then you're missing the point. The first way is your liberation. The second way evokes fear and worry and shame and of course makes everything much worse than it was to begin with. The next time you are stressed, anxious or depressed, and you feel like your mind is shutting down, try letting go and not resisting it. Just breath, and notice your feelings when you stop fighting for control of your mind. There is no thought that is so important that it can't wait a few minutes to be dealt with. Value the emptiness. If you don't make time to be still and empty, your brain will do it for you anyway. There's nothing to fear. This is one of my favorite inspirational videos - a lecture by a brain scientist who actually had a stroke - and was able to observe her own loss of the ability to "think" and yet remained conscious - and experienced an expansive state of blissful awareness that taught her more about reality than her critical intellectual thoughts ever could. Enjoy! But the fact is, daydreaming is one of the most productive and useful and healthy things a person can do; When that is taken away, and seen as a sign of weakness, we lose one of the greatest powers that we have. Once the mind has a clear vision and you feel passion for that vision, you will have all the energy and motivation you need to create it. But when we spend our energy and time on things that don't really matter so much to us, we find ourselves depleted, hopeless, frustrated and bored. You can test yourself out by seeing if you can allow yourself to fully imagine your ideal life - right now. Just close your eyes, sit back for at least a few minutes and see yourself as you wish to be. See yourself in the life you've always wanted - imagine what it feels like to be there, what it looks like, sounds like and tastes like. What would you spend your time doing in that world? Who would you spent your time with? What would your personality be like? How would you speak and express yourself? Now if you can do this exercise without any negative thoughts, mental confusion or resistance getting in the way - consider yourself very lucky - and keep doing this every day until your life starts to resemble your vision. If you're like most people, you had some form of resistance within seconds of trying this. Thoughts of "I can't have that," or "what would people think of me if I had all that," or "I don't really deserve that." Or resistance could come in the form of indecisiveness -- too many different ideas and desires all competing with one another - so that there is no clarity to the picture in your mind. When you identify these areas of resistance, be it guilt, feeling undeserving, feeling that it's impossible, fear of being disliked... whatever it is - you now have a clear path for working on these issues and releasing them for good, using Meridian Tapping/EFT. "Good thoughts keep off bad thoughts. They must themselves disappear before the state of realization." "Meditation is sticking to one thought. That single thought keeps away other thoughts; distraction of mind is a sign of its weakness; by constant meditation it gains strength." This guided meditation audio, along with an additional segment is now available for sale on my website. You can listen to part one (the first 15 minute meditation) for free directly on the site, or by clicking the player below. The second link below will allow you to download the 15 minute meditation for your personal use - only available for free through this newsletter. Tips on Meditation....the Hamsa Technique - The Original "Mindfulness Meditation"
Mindfulness Meditation is quickly gaining popularity and even mainstream influence as a therapeutic technique for improving mental, emotional, physical and spiritual wellness. Most people think that Mindfulness Meditation (or Vipassana) comes from the Buddhist traditions - which indeed it does - however, its true source is older than that. The real source of these techniques originates in India, with the Yogic traditions. The "Hamsa" meditation is a technique of mindful breathing, while mentally repeating the word "Hamsa" divided into two parts - "Ham" (pronouced HUM) on the out-breath, and "Sa" (pronounced SAW), on the in-breath. Hamsa literally means "I AM THAT" or "THAT I AM." In the ancient Nath Sampradaya (sect) of India, this mantra has been taught and practiced for thousands of years and this mantra (repeated sound/vibration) is said to be the natural mantra that is going on subconsciously, from the moment of birth, when the first breath is taken. Witnessing the breath, passively, while repeating HAM-SA with every in/out breath, gradually calms and stills the mind and leads to a blissful state of natural enlightenment, called Sahaj Samadhi. This simple practice is deceptively powerful, yet easy to learn and practice. This is part of one of the meditation techniques taught to me by living Kriya Master and Nath Yogi - Yogiraj Siddhanath. One of the most easy and all-around important pranayama techniques to use while meditating, focusing the mind, or simply seeking to calm your anxiety or stress, is Ujjai. Ujjayi Pranayama – “Victory Breath” “Ocean Breath” or “Psychic Breath” – This breath is very important and has numerous benefits. An excellent pranayama for depression, anxiety and stress. Ujjayi is very calming and soothing to the nervous system and this type of breathing can be done during meditation, for added benefit and to lengthen the breath. There is a slight constriction of the glottis, in order to produce a soft whispering sound in the back of the throat. It soothes the nervous system, calms the mind, relaxes the body, relieves insomnia and slows the heart rate. The sound may be barely audible to another person, buy you should hear it inside your own body easily. The whisper is produced on both the in and out-breath. This can be practiced safely at any time you wish. After some practice, taking even one breath using Ujjayi, you will find yourself in a pleasant, mildly altered state of consciousness, feeling calm, focused and comfortable in your body. My website now offers F*R*E*E answers to your most pressing questions. You can choose to submit them with or without your name, or make up a name. If it's a well written question that I feel our readers can benefit from, I will answer it and post both your question and my answer on it's own special page on my website. Others can comment, or give their own advice too. Where else can you get instant advice from a licensed psychotherapist? Ask Away! I'll do my best to give a helpful answer. Why Wait... Ask a Question Now! Meridian Tapping Videos - coming soon!